Depend on the durability and versatility of Bianchi's PatrolTek Triple Threat magazine pouch. 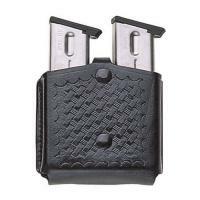 Carry the mag pouch either vertically or horizontally on the duty belt. Its simple open top design allows for quick accessibility, yet holds magazines securely in place with adjustable tension screws. Bianchi's magazine pouch is available in three sizes to accommodate most 9mm, .40 or .45 magazines. The Triple Threat pouch, as part of the PatrolTek line, is fashioned from Bianchi's premium gun leather and comes available in plain or basket weave finishes. Bianchi's firearm accessory delivers lasting performance and reliability in a variety of weather and tactical situations. Love it, the only thing to make it better would be for it to have the tensioners in the exposed brass. I really like this magazine pouch. They are somewhat rare in that a lot of companies don't carry it any more. The only thing I would improve would be the basketweave. It seem awfully shallow. I remember when Bianchi"s products had a deep well dfined basketweave, but a lot of companies don't seem to have the attention to detail like they used to otherwise, very satisfied with it.